Soon after Col. Robertson took over 3/26, Lt Tom Esslinger, who had been at Khe Sanh, showed him this poem written by Pam Zorn-scribbled on a piece of lined paper. 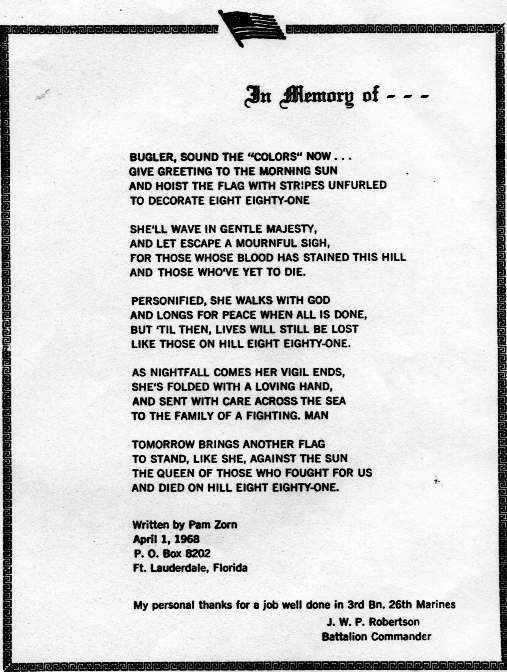 Deciding that this poem should honor the daily Flag raising on Hill 881-that he was told took place in Captain Bill Dabney's Company accompanied by a bugler, Robertson instituted an evening gun salute (a 106 Recoiless Rifle fired in the direction of the Enemy) at evening colors (with bugler). An individual Marine was selected each Day to read this poem as Old Glory was lowered. This ceremony was repeated while the battalion was "in garrison" at the Phu Gia Pass, north of Hai Van Pass. Later, Sgt Major Turner found a way to get the poem printed and every effort was made to give each Marine of 3/26 a copy when he left the battalion as thanks for his service.